Multiple colors available like transparent,Red,Blue,Green,White,Brown…etc. Available in maximum four colors print by Rotogravure Prints. *Availability to produce on request widths and characteristics different from standard. 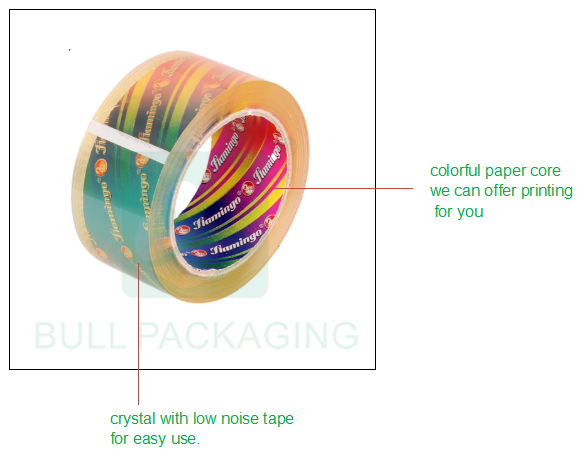 The length, width, thickness and color of bopp packing tape can be customized,and we can offer print.You could let us know your ideal directly.We will give you the best solution if you need. We offer all kinds of packing. Our tapes could be packed in many ways.You could let us know your ideal directly.We will give you the best solution if you need. OEM is acceptable.Please kindly let us know package type you prefer to. We will do our best to satisfied you. We could offer: PVC Shrink wrap with round card,PVC shrink wrap with side label,POF with self adhesive label,printing PVC shrink wrap,sleeve card,pillow,PE bag with side label,blister card,polybag,flat shrink of rolls,Vertical shrink of rolls with side label, displat carton,etc. Select the appropriate packaging depending on the product and your requirements. Our designer will make carton and label design for you as your requirement, then send to you for confirmation. We will add all item picture in the PI for avoiding any mistake of your order. We can offer printing paper core and shipping mark for you as your requirements. We will booking the vessel for you when it is going to be finished. We will inform you that detail ship date once we get the information. We will update the vessel information(ETA&ETD) for you. 2 production bases , factory area 50,000 FT2. 5 sets stretch film production machines , 38 sets Rewinding machines , 3 sets coating machines , 17 sets cutting machines. We always attend these Fairs: Canton Fair, Paper World Fair, Dubai Fair, Frankfurt Fair. Our stretch film material LLDPE is imported from Exxon Mobil.